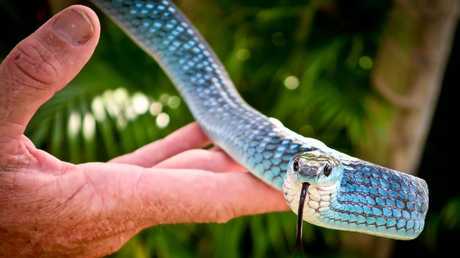 A DAZZLING blue python has been captured near Cairns as a skyrocketing number of pet cats get gobbled by snakes. 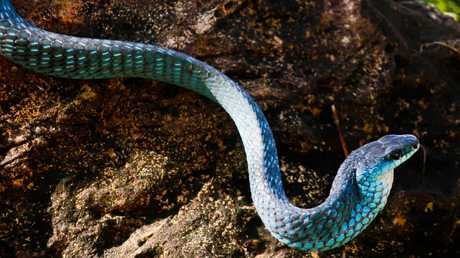 Cairns Snake Catcher's chief reptile wrangler Matt Hagan was called to a property in Gordonvale to find a blue phase common tree snake "shining like a jewel" and threatening to enter a home. "They're a pretty rare find," he said. "There's a little population in Gordonvale and south of Cairns, that's where we catch the vast majority of them." Mr Hagain said it was rare to find one of the species over two metres in length. This one was about 1.5m - a pretty average size for the vividly-scaled creature. 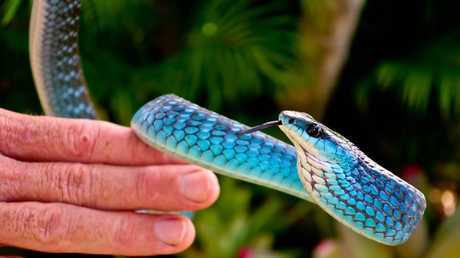 "Basically wherever you've got green tree frogs around the home, that's where you find common tree snakes," Mr Hagan said. "That's their prey and it brings them closer to people's houses. "They come in and harvest people's tree frogs, much to their dislike. "I'd prefer the tree snake, to be honest - they're quieter and better looking than frogs too." Mr Hagan said snake activity had spiked in the recent wet and hot conditions. Unfortunately some household pets have also met their demise. 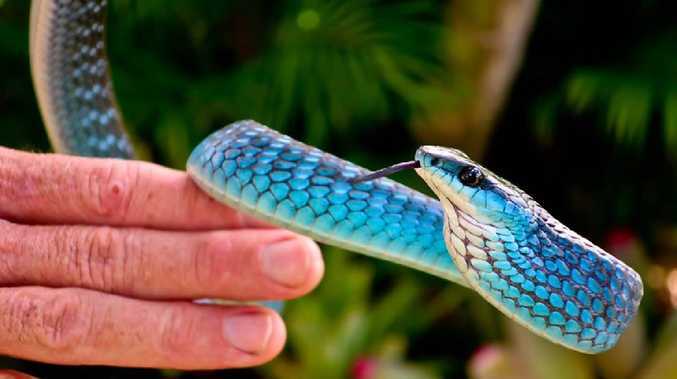 "I've had to retrieve about three or four snakes in the past few days with cats still inside them, much to the owners' distress," Mr Hagan said. "Then if the cat's got a flea collar, we actually have to get a vet to surgically remove it or it can poison the snake. "It's a bit of drama for both the snake and the cat." Mr Hagan said quite a few chickens were also disappearing across the region. "Rain triggers a whole heaps of other smaller prey for the snakes, so they get a lot more active," he said. "And they're on a growth spurt at this time of year. "So you've got the food chain at work."